As soon as Apple’s “first Android app” went live on Google Play, Android users went “thermonuclear” against it. But the funniest part is, while it is being marketed as Apple’s app, it wasn’t actually developed by the iPhone maker. Instead, Apple used an app already live on Google Play under a different name, as noticed by Phandroid. After looking under the hood of Apple’s Move to iOS app, Phandroid discovered that what you are downloading as “Move to iOS” app from Google Play, is actually Media Mushroom’s white label app. Here is why. Since it specializes in migrating data between devices, Media Mushroom already has two apps on Google Play and iTunes: Copy My Data and Device Switch. 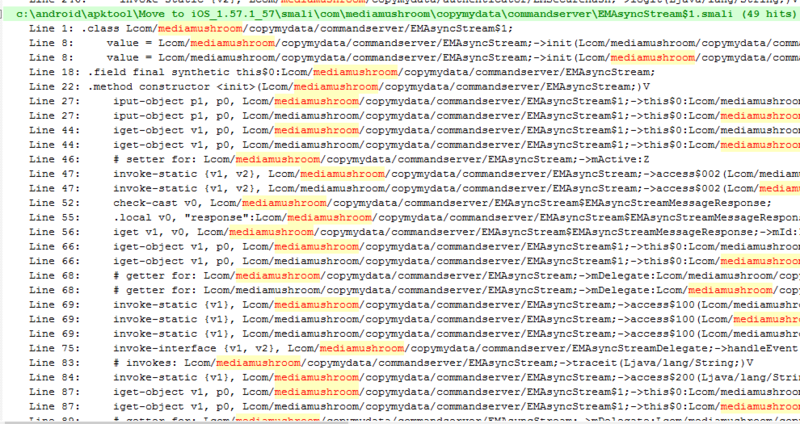 Phandroid compared the Move to iOS and Copy My Data apps only to find that, besides the packages’ names, the two apps share the vast majority of code and functionality and all com.mediamushroom.copymydata strings were left inside Move to iOS. Maybe it’s easier to say what differs between the two: the Apple artwork, licencing agreements, and the lack of Media Mushroom’s UI elements. Since the UK-based company has an “extensive library of reusable white-label software”, it was an easy choice for Apple: it simply acquired licencing rights, and performed the necessary changes. How simple is that?